Duty, Honor, Country: The long grey line gets smart! From the Boston Globe comes an interesting story about the mass exodus from military service of recent graduates from West Point. "Recent graduates of the US Military Academy at West Point are choosing to leave active duty at the highest rate in more than three decades, a sign to many military specialists that repeated tours in Iraq are prematurely driving out some of the Army's top young officers. 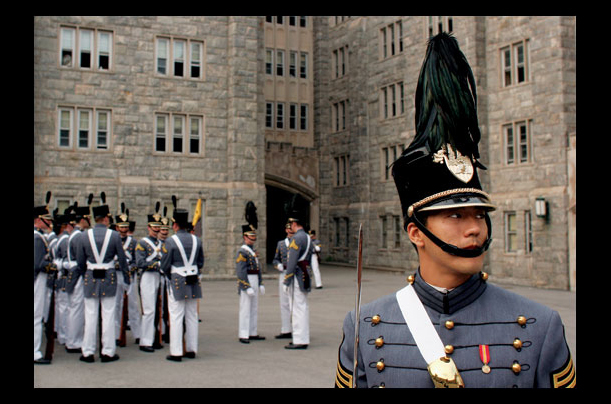 According to statistics compiled by West Point, of the 903 Army officers commissioned upon graduation in 2001, nearly 46 percent left the service last year -- 35 percent at the conclusion of their five years of required service, and another 11 percent over the next six months. And more than 54 percent of the 935 graduates in the class of 2000 had left active duty by this January, the statistics show." Several years ago I visited West Point with a boy scout troop. I was fascinated by the rhetoric of General Douglas MacArthur's farewell speech to the military academy, words engraved in marble at a memorial in the middle of the campus. "The long gray line has never failed us. Were you to do so, a million ghosts in olive drab, in brown khaki, in blue and gray, would rise from their white crosses, thundering those magic words: Duty, Honor, Country." I wonder what the million ghosts would say about the deranged, dishonorable debacle George W. Bush requires our troops to endure in Iraq.